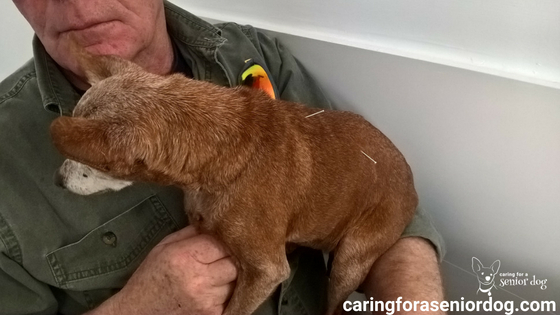 Our most important goal in caring for a dog with arthritis, is making sure they are as comfortable and pain free as possible. The good news is there are some quick, easy and helpful lifestyle changes you can make, starting right now. Elevating the bowls means less stretching so less chance of pain when drinking or eating. There are lots of great adjustable height bowls on the market, in a variety of price ranges. Alternatively you could do what I do and that is to turn a casserole dish upside down, and put the water bowl on top. That is a perfect height for my small dogs, but you’ll need more height if you have a bigger dog. You can do the same with the food bowl, although I always held it for Red because she had a bit of dementia and sometimes had trouble finding her food. If your dog seems perfectly happy with the bed he has now, fantastic. However, if it looks like he’s having trouble settling, it may be time to consider something different. What he will be comfortable with may take some figuring out, so be prepared for a case of trial and error. Over the years Red had a variety of styles, and she was been happy with all of them. All that changed about three years ago when, quite by accident, we discovered how much she loved to sleep on a comforter. Long story short I was away and my husband was in charge of caring for Red. One night she would not settle, no matter what he tried. He finally put her on the bed on top of a comforter, and she didn’t move until the morning. I no longer bothered with a dog bed but instead used double comforters. They’re cushiony and were easy enough for her to fold into the varying shapes she liked. I put a self warming mat underneath, a blanket on top and she was tucked in and loving’ it!! Ramps are handy for pets needing help getting in and out of the car, on and off the bed/couch or having trouble using stairs. Check the length against your car before you buy, as a gradual incline will be easier for your dog to walk up and down than a steep one. Carpeted pet stairs mean your dog still has access to your bed, or living room furniture! A pet stroller is something I can’t say enough good things about. I wrote a review about the one I bought for my little dog, and it was worth every penny. It’s lightweight, has a basket underneath for stuff, folds easily with a hook to keep it closed, cup holders and compartments on a padded handlebar, and mesh in front and back for airflow. 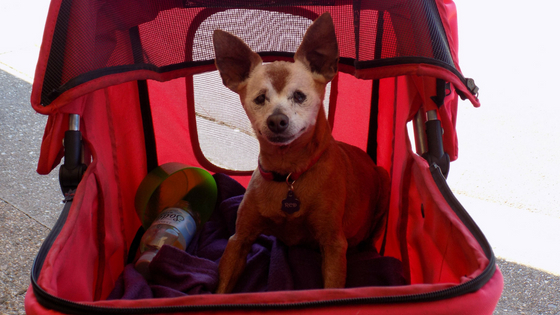 Red was able to join us on a lot more outings, and when she needed a rest she had a comfortable stroller to ride in. I added a blanket if it was cool and off we went. Nails that are too long make walking uncomfortable. Because the quicks on older dog’s nails tend to be quite long, very little of the nail can be trimmed at a time, and that means more frequent visits to the groomer, unless of course you do it yourself. At night I would block off quite a large area around my dog’s bed, then cover the floor with pee pads. If she had to pee overnight she would do what she had to, then go back to sleep. The bonus is she didn’t have to wake me up to take her out! Slippery floors and arthritic dogs are not a good combination. I am not suggesting you invest in wall to wall carpeting, but there are quick and easy things you can try. It may sound counter intuitive to exercise a dog that’s having trouble walking, but it can help. Short walks on even surfaces and swimming are two great options, but speak to your vet to help you determine the best type, frequency and duration of exercise and play. 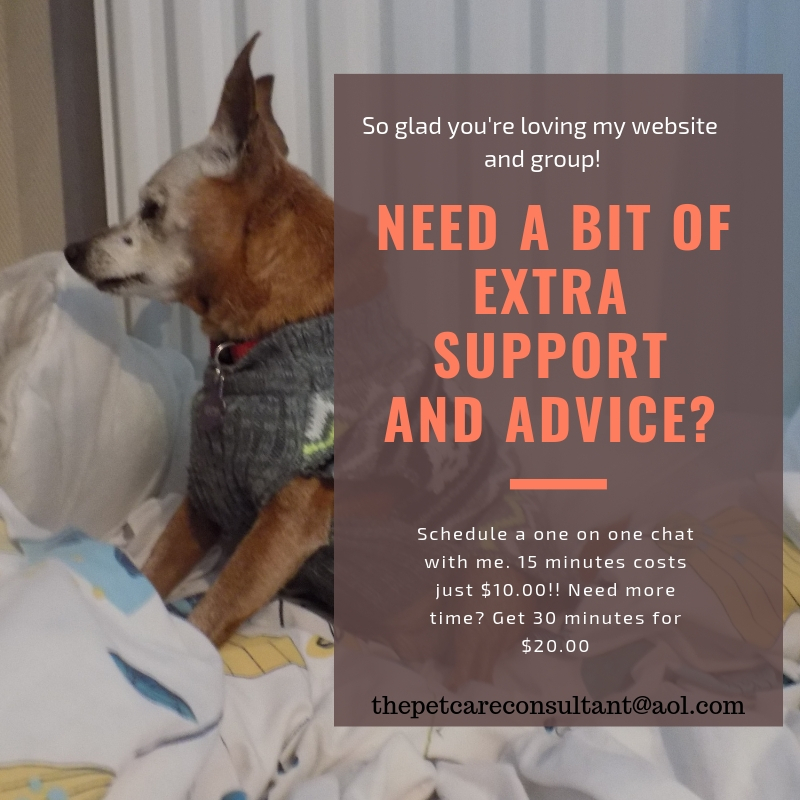 I hope you have found my tips helpful, and you can see how easy it is to help keep a dog with arthritis comfortable, and improve his quality of life. 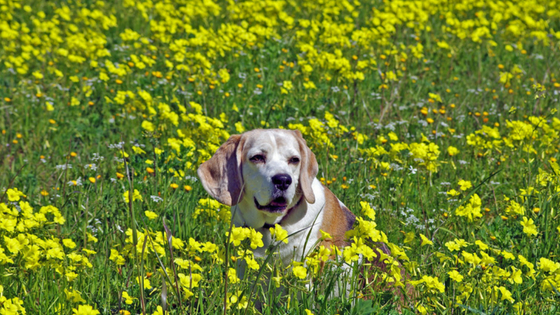 What lifestyle changes have you made that have improved your dog’s quality of life? I’d love to hear from you so leave your comments below. Hi James, I’m glad you enjoyed this article. It’s always nice for me to read the lengths people are willing to go to care for their pets. It should be a given, but sadly it isn’t. Hi Jazzi, Thanks very much. It’s nice to know you’re spending time thinking about whether or not to get a dog, and realising the commitment involved. It’s a big adjustment, and not everyone is able to take it on due to lots of other commitments. If you decide you’re ready one day, please feel free to contact me, I’d be happy to do what I can to help. Hindy, Thank you for such an informative article on aging dogs. 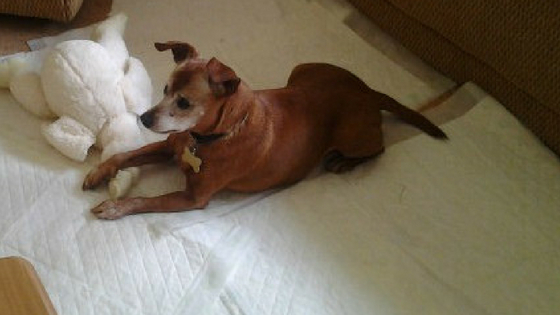 You shared some very helpful remedies for our aging dogs. Sometimes we forget that our pets can have ailments and need attention just like we do. Hello Diane, I’m glad you found the information helpful. I suppose it’s true may people don’t realise dogs face many challenges as they age, just like we do. The only difference is, they rely on us to take the best possible care of them. I am not kidding, it is like you are writing articles especially for my friend’s older dog! Such good tips. As I said in my previous comment, she did line the floor with throw rugs to make it easier for him to walk around. I have seen him slip a few times and he remains skittish for a while after. His nails were also a problem so they bought those nail covers things. It also helps him have a better grip when he walks. However, they do not stay in place for a long time. I will also suggest she does the raise bowls, it might help him. Hi Emily, how are you always nice to see you here. I’m so glad the articles I’m writing are relevant. They’re based on my experiences so I figured they’re not uncommon. I end up taking Red to the groomer quite often for nail trims, or when we’re at the vet I ask them to do it. Because the quicks are so long in older dogs, they can only cut a bit at a time. Raising the bowls definitely helps Red. I never thought of elevating their dog bowl. That’s a great idea. It seems that would keep their spine better aligned. I’m considering a dog bed but not sure what kind to get. Your suggestions? Hi Rawl, elevating the bowls have definitely helped Red, I can see how much more comfortable she is. I will be writing about dog beds down the road but for now all I can really say is, every dog is different, so it’s difficult to recommend one. For instance, Red loves a comforter so I bought her a single one, put it on top of an old bed she likes, but doesn’t anymore because it’s not “cushiony” enough for her now, throw a blanket on it in case she’s cold, and she loves it. She likes to have either a bed with higher sides or the ability to make a pillow. She doesn’t like a flat hard bed. There are several styles of orthopedic beds around – some have an elevation at one end to form a pillow, others have three sides, and some are just flat. You can get ones with magnets which are supposed to be good for arthritis, or add a heating pad to the bed your dog is already using. See what your dog likes, and try and improve on it. Hope this helped! We have a senior dog and we’re at the stage now where we may need to be putting pee pads down overnight, too. We tried pet stairs with him for a while, but he didn’t want to use them. Great tips! Start shopping around for the cheapest ones!! I know quite a few people use washable pee pads but I never did. It got to the point where my entire floor was covered in them. I always said I wish I had bought stock in the company! Great tips! I’m always interested in learning how we can help care for our dogs so that they can have the very best life possible. I’m happy to see ToeGrips on your list of products for arthritic dogs! Thank you! I’ve never used them myself, but I’ve heard some good reviews and I always do my best to include as much helpful information as I can. Yoga mats! I love that idea. We have hard wood floors and they were very slippery when our first dog was older. Now that Ruby is getting older I am starting to thinking about how to keep her safe and comfortable as long as possible. I do too!! Someone in my FB group mentioned them and thought it was a great idea. Hard wood floors are so slippery for all dogs, so things like yoga mats and rubber mats are great options. My friend thinks her dog may be suffering from arthritis, and after reading this I think she may be right. 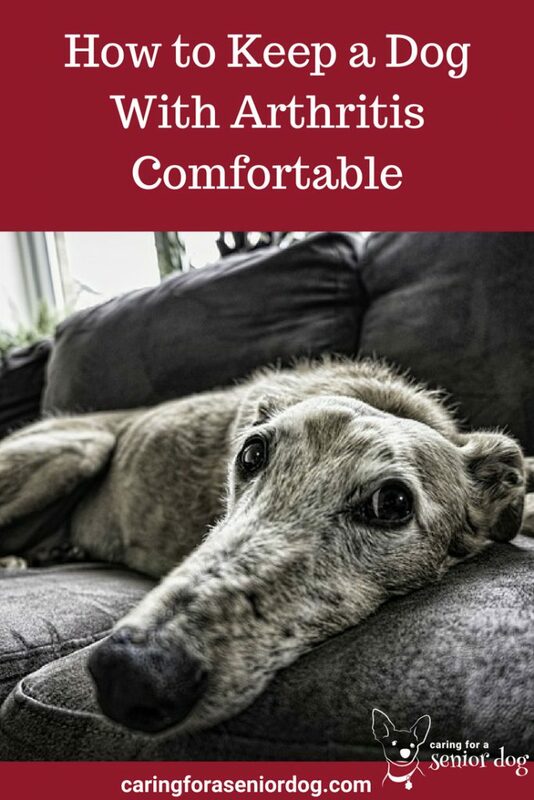 I’m definitely sharing this post with her to give her some great ideas to make her dog more comfortable. I hope it helps your friend with her dog. If she’s interested she may want to join my FB group Senior Dog Care Club. Lots of great support and advice if her dog is a senior. My current dogs are technically young seniors, so I’ll be watching them closely and trying to help make the accommodations that they need. You certainly gave Red a wonderful life! Thank you Beth, that’s kind of you to say. I did my best for her, she was my love! Nails are so important. Nails that are too long mess with the health of a young dog; even more so one that already has problems. Also absolutely agree with the floors. If you cannot change the floors, consider ToeGrips. I like knowing there are some options when it comes to helping dogs on slippery floors. We aren’t quite there yet – I don’t imagine it will be too long, though. These are great suggestions. Especially, the pee pads. I have a ‘retired’ breeding dog from a puppy mill (way too many litters). Reese doesn’t suffer with arthritis but her little bladder is becoming an issue. Fantastic to hear you have a puppy mill rescue. Those poor dogs suffered so much, they deserve a loving home. My entire floor was covered in pee pads. While it did drive me mad (slightly!! ), at least I knew I wasn’t going to come home to pee stains on the carpet. The key is to really overlap them otherwise they will find a way to pee in between…even the blind ones like my dog. Another excellent senior dog post, Hindy! I have Pinned it as well to share. With my 13.5 year old gal having arthritis, I see the differences in when she lays down. She has an ortho bed with a small cooling mat (Huskies like a spot of cool! ), and she will get up a few times to reposition herself, slowly settling back down now from the arthritis stiffness accompanied by some panting. Sometimes, she opts for the floor, but mostly stays on the bed. I have Tramadol for her, but with GI issues, I took her off and now give her CBD treats along with supplements, and have seen some very positive differences in both the panting and her getting a good night’s sleep. It is so hard to reconcile that our baby girl is a senior now, slowing down a bit, but thankfully, still has her peppy moments that warms my heart. Thanks for saying that Dorothy, and thanks for pinning! I’m glad you found some things to help with her mobility. Jack is my first young dog, so up until now I’ve never experienced watching a dog get older, but I imagine it’s a little sad seeing it. With so many wonderful supplements and treatment options, there’s so much we can do to keep them feeling good for as long as possible and I find that encouraging. I believe my mom’s dog is beginning to get some arthritis. So far he still doing OK, but is obvious he is slowing down. He loves to jump on the couch with my mom, so we’re probably going to need to get him a ramp or some steps. They will make such a big difference to his quality of life. If your mom is looking for suggestions for natural treatments for arthritis, have her check out the mobility section on my website. I’d get him started on something right away!! If you have any questions are want specifics let me know I’d be happy to help.